A team making up the eRoadArlanda project has announced that they have electrified a section of road near Stockholm, which will be tested by a battery-powered test truck. The team is part of an initiative set up by the Swedish government's Transport Administration to meet its goal of carbon neutrality by 2050. The Swedish government has been funding projects aimed at developing a fossil-free road transport system for many years. In this new effort, the focus was on implementing a road technology that could be used by currently available vehicles. The result is what some have called a human-sized slot car system. Slot cars are toy-sized cars that run on a track that also provides power via a metal drop-down rod on the undercarriage that slips into an electrified slot in the track. In the Swedish road project, the test truck has a similar drop-down arm that slips into a slot in the road and touches an electrified element that carries power to an onboard battery. 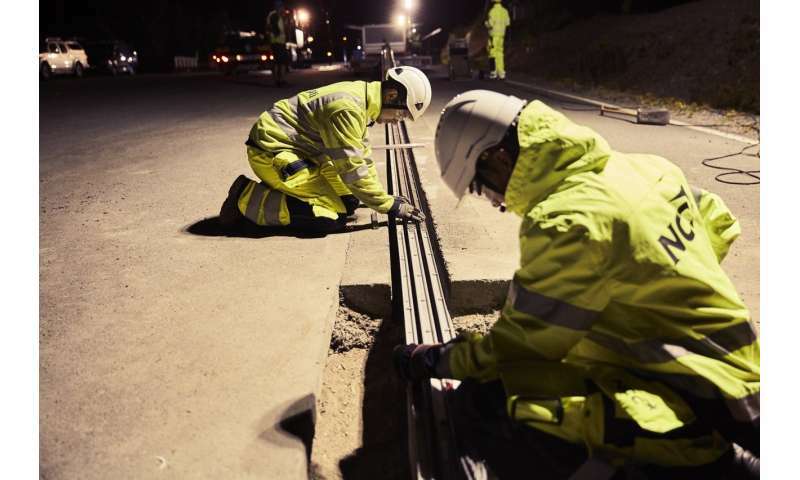 For the project, the researchers installed an electrified slot along two kilometers of road between the Rosersberg logistics site near Stockholm and the Arlanda Cargo Terminal. While other vehicles will be able to use the road, only a test truck will make use of the electrified rail. In announcing the deployment of the rail, team members also reported that the cost of laying it was approximately €1m per kilometer, which they claim is 50 times lower than installing a tram line. The rail is actually two rails, like a light socket, the team explains, installed in 50-meter sections. An arm from a vehicle settles inside the slot between the two rails, drawing power while the car is in motion. They note also that the rail only offers power when there is a vehicle present to draw power from it. They have also taken measures to ensure the rail is functional during inclement weather. The system also measures how much power is used by a vehicle so that the owner can be charged for it. The eRoadArlanda project members suggest that more such rails will be installed soon, and that commercially available battery-powered cars and trucks will soon be outfitted with arms for accessing the rails, allowing them to get power on the go, instead of having to stop and charge up. Don't drop a coin in the slot, or you'll stop a whole roadway. How do you overtake, or take a left turn, or stop to answer your moblie phone as the law demands, Oh I forgot, you put a penny in the slot. Well that seems dumb. Ever hear of induction? Oh yea a little winter salt should do wonders for that system. Add the occasional bit of road debris metallic or not and you have the makings for quite a show. The AGW religion makes people and governments do strange things. Here is another "Brilliant" AGW approved breakthrough. "The slot was only used as a physical guide." There's two systems. One has thin rails separated on either side of the slot in the plastic track, and the other one has two thick rails in the middle with a gap in between for the guide pin. The former is used for small slot cars because the rails are spaced apart just so they would meet with the magnets in the motor of the car and so the car keeps pulling itself to the road. The latter is for larger slot cars that have enough mass and traction to keep to the road without. The smaller cars just keep flying off without the magnets. This is one of several Swedish test projects, so I can add some context. As the article notes, only a car dropping a power feed arm is able to draw power, so - if the system works - there is no problem with short circuits. Like the other systems the power draw is when able in battery cars, so when the truck needs to turn it can. (The test road is AFAIK one way to the airport, so this will likely only happen for emergency stops.) Truck guidance will be automated, and AFAIK one goal is to mix it in with the upcoming truck caravans with - again voluntary - passive followers. Another project is akin to the one link that reports on a n overhead feed wire, similar to electric trains. It has been ongoing close to where I grew up, and it looks to work well. I do not think that project can charge vehicles individually tho'. I think there was an induction project; it did not work. @MR166: What is your evidence that the AGW process is 'religion'? Let us stop that, facts are facts even if, especially *if*, they hurt, before hundred of millions need to relocate and the equatorial regions become deadly [!] for humans. Yes, that is what is the prognosis now, starting from something that now we can check on an Excel sheet at 3 sigma simply by statistical correlation since the global temperature change signal has become so strong. In bradford they used to have electric trolly buses, worked perfectly so they dismantled them. What happened to my ignore list? I see all the dumb asses on this article. alexander "In bradford they used to have electric trolly buses, worked perfectly so they dismantled them"
"So what killed the streetcar? The simplest answer is that it couldn't compete with the car — on an extremely uneven playing field"
This looks like a cool experiment - will gather a lot of data. Most cities have defined bus stops. Perhaps they could include overhead chargers that could recharge the buses batteries as people exit and enter the bus. The stops could be located near light poles so that existing wiring could be used. The cost of this type of project should be reasonable. greenonions1 the trolly bus's used to have overhead electric lines and the bus's could drive round parked cars they had rubber tyres running on the road the council used to add more stops by simply adding more electric lines to the light posts.